Kids, Parents & Technology: A Guide For Young Families by Dr. Eitan D. Schwartz is an excellent guide to help me as I try to raise three young children in the world of technology. 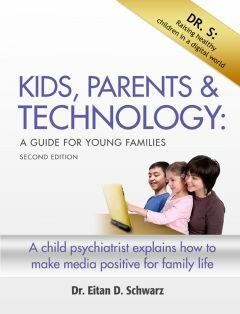 Written by a child psychiatrist with over forty years in practice, the author’s goal is to “explain how to make media positive for family life.” My husband and I made the decision together long ago that we would significantly limit our children’s access to television, cell phones, video games, the computer and all other forms of media. We have a set schedule for limited access to these forums and I really appreciate that Kids, Parents & Technology: A Guide For Young Families by Dr. Eitan D. Schwartz takes my concerns into account within the text and gives real life solutions and “Media Plan.” We don’t want to forbid certain media from our children’s lives but as parents we do want to take control. The author succeeds in writing a book that is realistic and practical. I also like that the book is broken into specific sections based upon the child’s age range which makes it easy to find information specifically for my child. · Think of all tech devices as home appliances that must bring value to family life and child development. · Create a media plan for each child that includes both limits and the benefits of growth opportunities: better family relationships, socialization, values education, and education Enrichment. · Make entertainment only a minor part of the media plan. · Avoid any device that does not serve family- and child-centered aims or provides only entertainment, especially if it will isolate the child with the device. · Schedule time to participate with the child and put limits of time and place for its use (or negotiate with older children). To learn more or to purchase Kids, Parents & Technology: A Guide For Young Families you are invited to visit the website.